I haven't had a "Friends on Friday" in a while...so I thought I would share a few pictures that my wonderful blogging friends sent me. These first 2 pictures are from Cathi at Shakerwood Primitives. Looks like she was a Tool Time Girl long before I was. She and her husband used a "T", a flange and a pipe to make this adorable paper towel holder....just too cute!! She has inspired me to make something with a narrow pipe for my spools of ribbon. Thanks Cathi for sending me these pictures. This next photo is from Tudy at Tudy's Craft Cupboard. 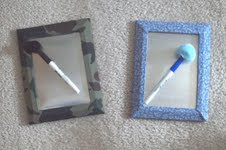 She used my tutorial for the dry erase board, but made hers extra special...she covered the frames with fabric. What a great idea to match a room or like she did, matched it for her grandchildren. I love this idea!! Thanks Tudy. Last, but certainly not the least, is a Tool Time if I ever saw one. Look what Nancy from the Tattered Garden made using a metal tape measure!!! She has a wonderful tutorial on her blog for this snappy bag , so go take a peek. Thanks so much Nancy! Thank you ladies for letting me share your photos and ideas today. I just love bloggers! Love how folks have been inspired by your Tool Time Tuesday ideas! Just popping in to say Hi and let you know that I still think of you although I haven't been around in blogland lately! I have my wedding in 2 weeks... it's been so busy! I look forward to catching up with you again when the waters are still! Yes, I do believe there are quite alot of us that REALLY enjoy your Tool Time episodes. I know I look forward to them. Great use of the papertowel holder. Hubby would like to see this unique "guy" one for the garage.